INNO3D, a leading manufacturer of high-end hardware components and computer utilities, introduces its new flagship INNO3D GeForce GTX 1080 Ti graphics cards. The new range will be available in Founder Edition and the premium iChiLL series by Abacus Peripherals. Designed on NVIDIA’s Pascal™ architecture, INNO3D GeForce GTX 1080 Ti iChiLL X3 and X4 simply own the concept of performance tops the previous flagship by no less than 35%. This makes it even faster in games than the world-famous TITAN X™ also built on NVIDIA’s architecture. The new hero GPU comes packed with extreme gaming horsepower, utilizing next-gen 11 Gbps GDDR5X memory, and a massive 11GB frame buffer. The new GeForce GTX 1080 Ti iChiLL X3 and X4 GPUs also come equipped with INNO3D’s unmatched iChiLL cooling solution –awarded for better performance at lower noise levels- improves the overall active temperature control. The Herculez Armor backplate protects the cards from outer damages as well and puts it way at the top of Ultra High-End graphics cards in the world. 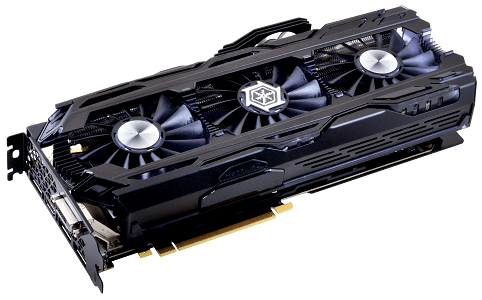 The entire series of GeForce GTX 1080 Ti comes with extreme performance, and Inno3D has used the highest quality components worthy of such a product. The iChiLL cooling solution makes the INNO3D custom-built graphics card to be the perfect weapon for every gamer.